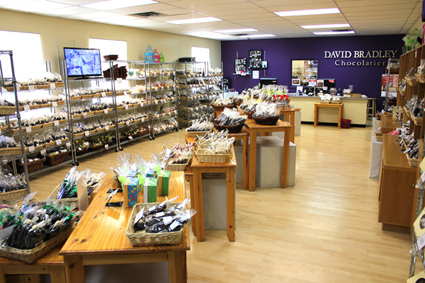 David Bradley Chocolatier was started by Bob and Marcy Hicks, and Bob’s mother Alma, over thirty years ago. Alma, Bob, and Marcy had always loved sharing delicious food and conversation with family and friends, so when in 1977 Alma, who was a widow, started looking for a fun business to start, it seemed natural that it would be something food oriented. They all decided that gourmet chocolates and gifts would be an exciting and fun business to run. Together, Alma, Bob and Marcy worked towards making their dream of creating delicious chocolates to share with family and friends a success. With very little knowledge of how to make chocolate, but trusting their own, and their family and friends tastes, they went about searching for a master Chocolatier who would make their chocolates unique, delicious and memorable. After tasting dozens of chocolate samples from Master Chocolatiers around the world their quest quickly ended after tasting the samples of Master Chocolatier, Pete Machisco’s, handmade chocolates. His fresh handmade chocolates had intense chocolate flavor combined with rich smoothness. They now had their Master Chocolatier and were ready to start making gourmet chocolates and gifts. Their business grew unexpectedly quickly and soon Bob and Marcy enlisted the help of their three teenage children Christine , David and Bradley. During the busy holiday season the whole family could be found at their chocolate factory making and packaging chocolates and gifts, sometimes late into the night. With each season and year, Bob and Marcy’s three children became more involved and knowledgeable about the business. In 1985 we lost one of our original founders, Alma. Her fiery spirit and enthusiasm for the business continued on with Bob and Marcy's leadership. Over the next 10 years the business continued to thrive with Bob and Marcy’s three children taking on more and more responsibilties and eventually working full time with the family business. Today, Christine is the Production Manager of the chocolate factory, David is the Director of Marketing and Bradley is Chief of Technology. Bob and Marcy are now semi-retired, although they still love being involved with all aspects of running the business and seeing their customers and friends, some who have been with them from the start. Currently there is one retail store located in Manalapan, New Jersey, along with the chocolate factory which manufactures and sells to over 500 businesses across the United States including numerous Hallmark stores, Hospital Gift Shops, and specialty retailers.